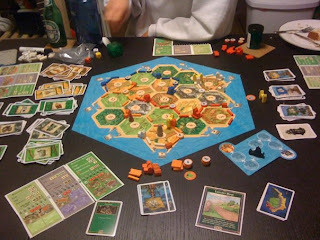 The Cities and Knights Expansion for Settlers of Catan is by far my favorite expansions. I also own Traders & Barbarians, which has a similar, but not quite so flushed out version of this expansion and I think they did a much better job with this one. This expansion: adds new resource cards, called commodities; replaces Development Cards with Progress Cards; introduces Barbarians, city walls, and a new die; and has a new way of dealing with Knights. The overall story of this expansion is that the island of Catan has become so prosperous that now local Barbarians raid the island. The new event die is rolled in addition to the resource dice that determines if the Barbarians move closer to the island on each turn. Three faces of the die move the Barbarians while the other three sides relate to the 3 different types of improvement tracks a player can explorer. Yellow for commercial development, green for technological advancements, and blue for political. Each improvement track also has a corresponding Progress Card deck. When the Barbarians reach the island, they battle with the Knights currently active on the island. If everyone's Knights combined are enough to remove the Barbarians, the player who had the most Knights in the battle earns a prize. If the Barbarians win, player(s) cities are ransacked and turned back into Settlements. To gain Knights, a player must purchase them and then move them about the board to defend territories from the Robber. The expansion also introduces an improvements track booklet for each player to track their progress. Different "levels" of improvements grant different things, such as the ability to do 2:1 trades at any time, with any resource type. Overall the expansion adds a new level of strategy to the base game, which increases the amount of planning players will have to do. The winner is the first player to 13 Victory Points, which will likely take 45 minutes longer to achieve than with the base game. I recommend this expansion for anyone a little bored with the base Settlers of Catan and wanting a bit more challenge... The Masters program of the University of Catan, if you will.